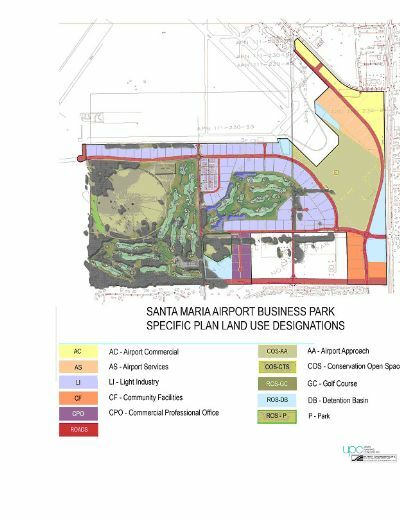 The Santa Maria Public Airport Business Park Specific Plan is a 20 to 30 year phased development project which will accommodate future light industrial, high-tech, and professional businesses, provide higher paying jobs to area residents, construct regional infrastructure improvements, provide for conservation of biological resources, and provide recreational opportunities. The Business Park includes ten distinct zoning classifications encompassing 740 acres on airport property. Each zone has development standards including building heights and setbacks, architectural requirements, landscaping, lighting, and signage. The following categories highlight the attributes of the Business Park Specific Plan. The Airport Business Park Specific Plan represents a major achievement for collaboration with multiple agency jurisdictions for conservation of endangered species. Mitigation Measures as outlined in the Biological Opinion include conserving in perpetuity over 105 acres of varying habitat types for endangered and threatened species including Vernal Pool Fairy Shrimp, California Tiger Salamander and California Red Legged Frog as well as other species. The project has been designed to manage both onsite and offsite storm-water run-off, alleviating a regional flood control problem. Storm water will be conveyed into a variety of onsite storm-water basins, including basins designed as water features for the golf course. A recycled water line will be constructed to carry tertiary flows from a nearby waste treatment plant to irrigate portions of the golf course. The Business Park will include an 18-hole championship golf course that will be an asset to employees and area residents. Many of the lots are located directly adjacent to the golf course, which will help to attract businesses and will provide employees a pleasant work setting. Nearly half of Santa Maria's workforce is either in the agriculture or retail sectors. Positions in these sectors are typically low wage earning jobs. The Specific Plan will result in the creation of over 3 million square feet of light industrial, commercial, and professional uses. The Specific Plan estimates the creation of over 6,400 higher paying jobs over the next 20 to 30 years.